… you ride into the city to be guest on The Bicycle Show even though it’s blowing a gale, 6C and raining cats and dogs. Then you decline all offers of lifts home in other people’s gas guzzlers. Bravo Rod Charles, historian, writer and cyclist extraordinaire! 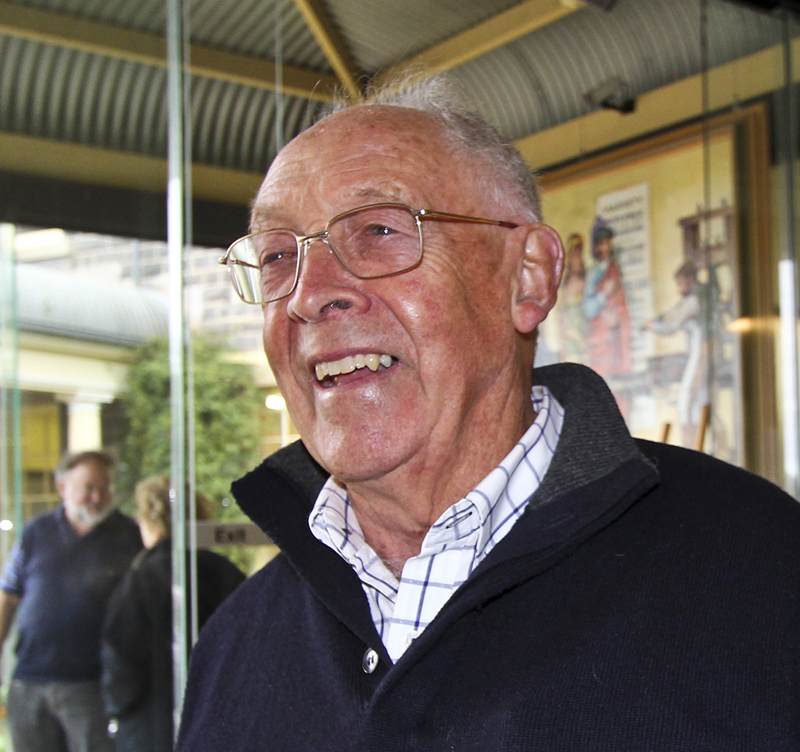 Rod’s appearance was the first of two appearances to discuss Volume 2 of A Whirr of Many Wheels: Cycling in Geelong. This volume chronicles cycling as part of the social structure of Geelong from 1914 to 1945. Sales were brisk at the launch of A Whirr of Many Wheels. Modern-day wheelman Allan Marshall snaps up his copy. Rod Charles at the book launch on 7th June, 2015. Watch out for podcasts of this and future episodes of The Bicycle Show when John gets them all set up on The Bicycle Show website. Three cyclists, Michael L, David F and Helen took part in this morning’s ride which was a circuit from South Barwon Reserve to the historic bikes exhibition at 123 Retro Antiques this weekend. Conditions were perfect for a ride west to near Mount Moriac before circling back down the old Waurn Ponds section of the highway and up Pigdon Street past Deakin University. 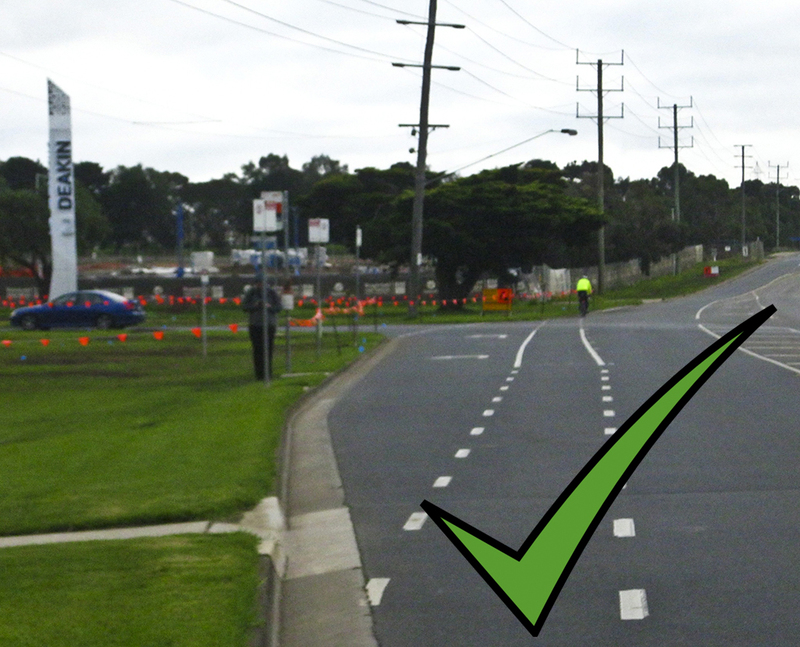 Here we noted two different versions of bike lane marking – one very unsafe and one sensible at the two entrances to the campus. Lower Deakin entrance. Bike lane is to left of turn left lane. Cyclists must cross this fast moving traffic lane to go straight ahead. Upper Deakin entrance. Bike lane goes straight ahead. 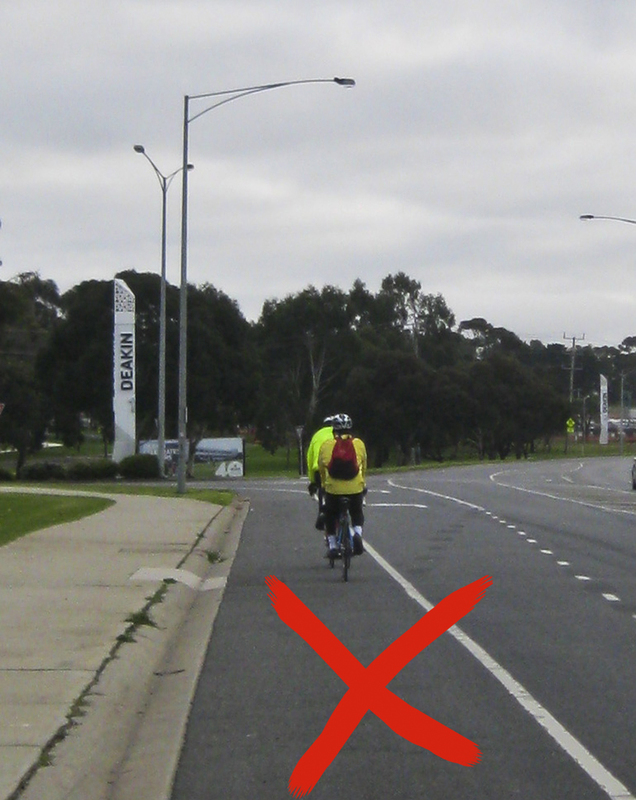 Left turning traffic must give way to cyclists before entering the left turn lane. As it was a Sunday, and an semester break for students, there was little traffic entering the university. Normally there is a great deal of fast moving traffic. To make the upper entrance even safer, green treatment of the lane would remind motorists to give way. The riders continued through Highton Village, Balyang Santuary and rode along Pakington Street to the coffee and historic bike stop in North Geelong. 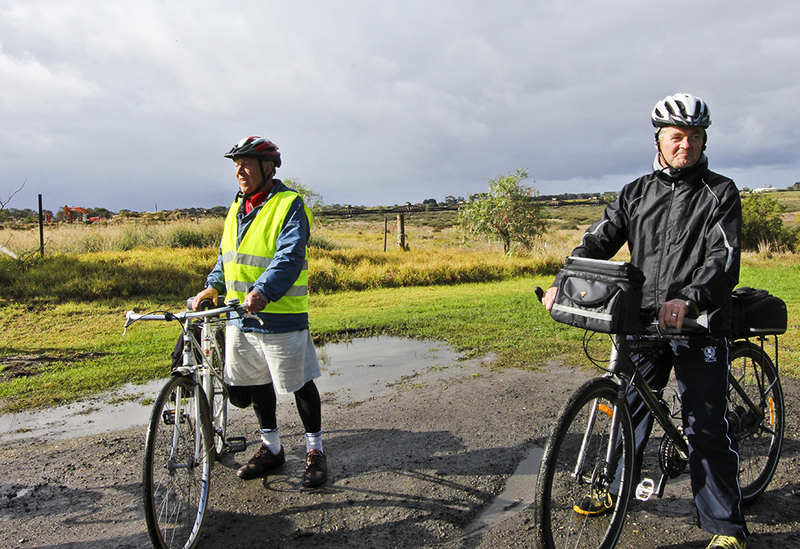 Two other Cycling Geelong members were already there – Rod, complete in retro cycling gear, and Heather. The display of bikes from the collections of three locals – Stuart, Robin and Daryl – was extensive and interesting, bridging the era from an 1818 hobby horse to modern road bikes, with everything from bone shakers and high wheelers to ladies bikes, tricycles, children’s bikes and “skate-board” simulating bikes. There was a bike for on water, and an early front wheel drive exercise bike. The cyclists returned to South Barwon Reserve via the waterfront and the Breakwater. I recommend these medium distance, leisurely rides to all club members. The distance was around 45 km, the roads quiet and sealed, and, as usual, the company superb. The launch of A Whirr of Many Wheels is to take place at Osborne House Swinburne Street North Geelong on Saturday afternoon 6 June 2015 at 2 pm for 2.30 pm. All are welcome. The subject matter is all things cycling in the period 1914 to 1945, to the war end with a focus on Geelong of course but cyclists tend to go everywhere so all that going everywhere is included. A smaller number of copies had been printed this time. Suggest if you wish to obtain one, before the event might be preferable. Today was the day when cyclists show their true colours! It was cold, it was wet! Undaunted, Rod’s smiling face met the dozen or so cyclists and a few extra hangers on who arrived for the annual celebration of historic cycling. 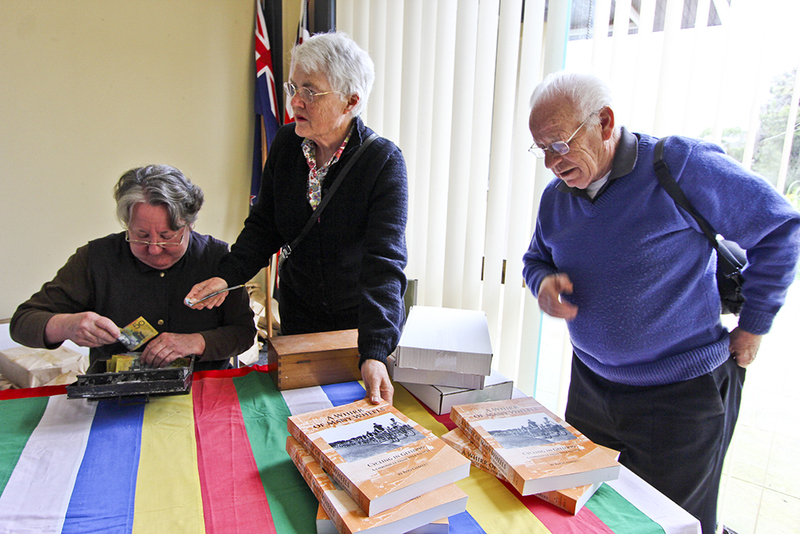 During the National Trust Heritage Festival of April May 2015 Cycling Geelong promoted a History bicycle ride from Corio Bay to the Barwon River, along Boundary road to the east of the city which delineated the early city. We noted how the city expanded during and after the two world wars and we picked up on features of town planning which changed during this time. We also noted aspects of the story of cycling as its worked itself onto the landscape from the times of the first velocipedes racing in the Eastern Park to the birth of the racing career of Russell Mockridge an Olympian from the district in 1952. The usual contingent of riders from Melbourne decided that their delicate aging iron horses should stay unsullied. They were sorely missed. Rod had planned a short, sharp hill especially for the high wheelers. As usual, Rod punctuated the ride with short expositions on cycling and local history. We learned that long before the advent of the penny farthing Corio Oval (in Eastern Park, near the East Geelong Golf Club) was the place of Geelong’s first track cycling race. We viewed historic housing throughout east and south Geelong – and had a distant glimpse of famous St Albans Park homestead. The original owners, as well as owning thoroughbred race horses, were also avid wheelmen. We detoured to glimpse the beautiful and historic ovoid sewage aqueduct over the Barwon near Breakwater. 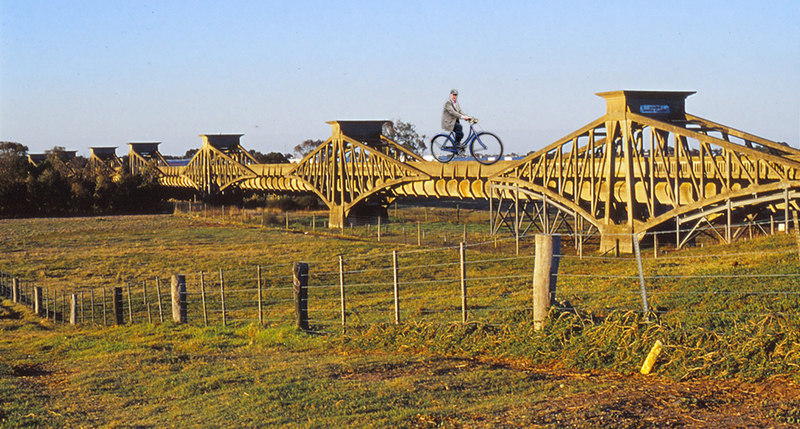 Rod wants a bike path over the walkway on the disused ovoid sewage aqueduct. Finally we rode from the Breakwater around the Barwon Path to Little Creatures for a coffee break, to be met by the warm and friendly hangers on who’d been enjoying a late breakfast. Not you with that camera again! After refreshments, the Swanston Street bikeway was negotiated to Maude Street, before a detour to view the original Geelong Grammar School building. Thanks to Rod for a most enjoyable and informative bike ride. *To hear the full (and ultimately tragic) story of Russell Mockridge you’ll have to wait for Volume 3 of A Whirr of Many Wheels (1940s-1980s). Volume 2 has just been published and will be launched in early June. 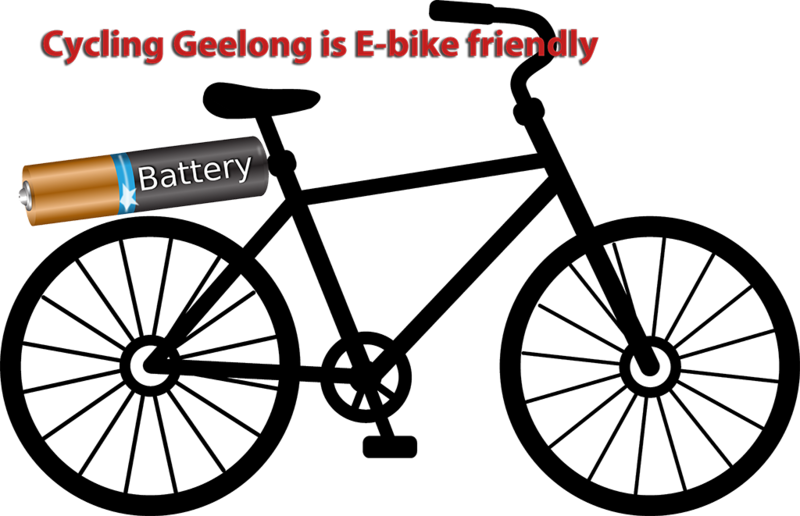 If you haven’t already seen the latest Cycling Geelong newsletter, download a copy here. Find out about Tricia and Shane Balkin’s trip to Spain, Victoria’s rail trails, some books to read, our committee’s antics, a bike review and even a recipe for a pre-ride dinner. There’s a glimpse into A Whirr of Many Wheels Volume II – soon to be launched on a heritage ride by the author himself – Rod Charles. Thanks to Peter Smith for a wonderful job of editing.